The combination of intensive physical exercise and supplementation with ginseng rejuvenates the muscles. Taiwanese biochemists write this in a study that will be published in the Journal of Ginseng Research. The researchers gave human 5 milligrams of the ginsenoside Rg1 [chemical structure above] before an intensive cycling session. A few days ago we also wrote about ginsenoside Rg1. The study that we're discussing today has been carried out by the same researchers. Their research was partly funded by NuLiv Science, [nulivscience.com]] and some of the authors are affiliated with NuLiv as scientific advisers. One of the applications that NuLiv produces is ActiGin, a combination of extracts from Rosa roxberghii and Panax ginseng. 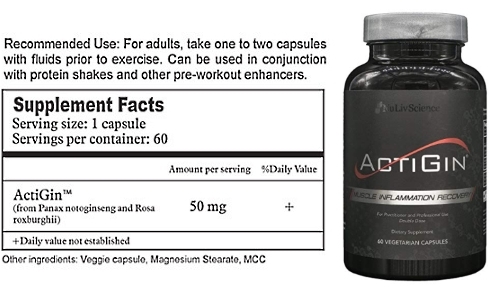 ActiGin should improve sports performance, increase glucose uptake by muscle cells and speed muscle recovery. On the internet bloggers and advertising guides substantiate claims with references to the studies of the Taiwanese. That is not so strange, because in the publication we are talking about now you can read that "this work was funded for [the] [..] the purpose of producing an ergogenic supplement Actigin for Nuliv Science". However, in this study the researchers did not ActiGin, but ginsenoside Rg1. We have not been able to find out how much ginsenoside Rg1 is in ActiGin. The researchers gave 12 untrained male students a capsule with 5 milligram ginsenoside Rg1, an hour before they started cycling with an intensity of 80 percent of their maximal oxygen uptake [VO2max]. The students had to keep continue this until exhaustion. On another occasion, the researchers repeated the experiment, but gave the students a placebo. For most students the ginseng steroid extended the time they were able to continue cycling. If you've read our previous posting about ginsenoside Rg1, this will not surprise you. The combination of cycling and supplementation with ginsenoside Rg1 reduced the concentration of beta-galactosidase. Bottom left you can see how ginsenoside Rg1 may rejuvenate muscles. If the students had used the ginsengsteroid, the researchers found more CD68 + macrophages in their muscles after the effort. These are cells that clean up damaged muscle cells, and encourage stem cells to take the place of the sided muscle cells. "The results of the study suggest that macrophage activation after Rg1 supplementation is associated with the observed senescent cell clearance of exercised human skeletal muscle", the reserachers write. Journal of Ginseng Research (2018), https://doi.org/10.1016/j.jgr.2018.06.002. The new ginseng preparation GINST15, which contains a modified ginsenoside, reduces feelings of exertion and muscle pain during and after intensive training, and maintains the functional capacity of exhausted muscles. Health scientists at the Kwandong University in Korea concluded this after studying 6372 men and women in the Kangwha region of South Korea for 18 years. 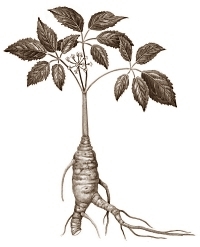 Ginseng boosts fat burning in the first twenty minutes of endurance activities thus saving valuable carbohydrates. Animal data.